“Three Saltus Grammar School students and Bermudian sports stars of the future have won places in US universities renowned for their sporting excellence”, according to a school spokesperson. “Tyquann Perinchief has accepted an offer at NCAA DI Appalachian State University [Boone, North Carolina] soccer programme. “Bryce Gonsalves has committed to join the Marymount University [Arlington, Virginia] basketball programme and will start his freshmen season in August. From left: Saltus student-athletes Tyquann Perinchief, Zakiyah Durham and Bryce Gonsalves heading for university in the fall. ASU’s Head coach Jason O’Keefe said: “Ty is a tremendous competitor. His work ethic combined with his skills will be a great asset to our programme and we can’t wait for him to join us in August. Bryce has been attending basketball camps in the US in recent years with U.S. Global Basketball Academy. Coach Alexander at Marymount said: “Bryce was never a major stat-stuffer and his tremendous value rarely showed up in the box score. Bryce’s intangibles are off the charts and allows him to impact the game on many levels. 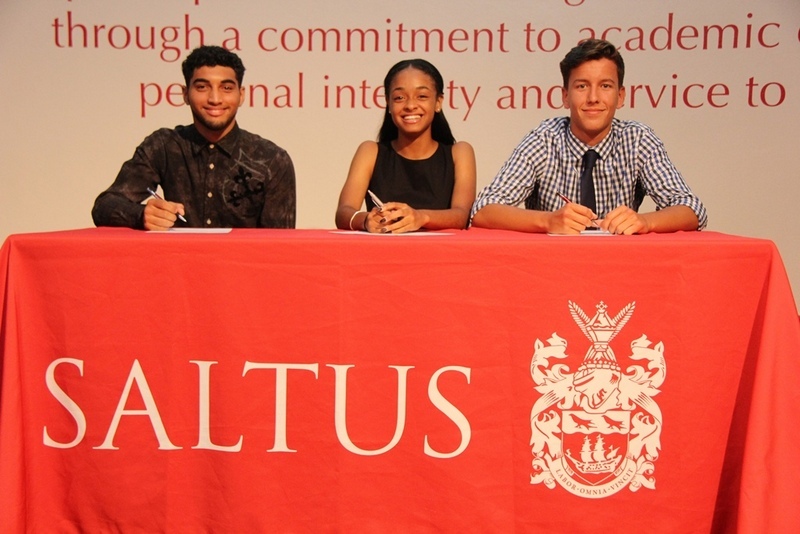 Darrin Lewis, the Director of Athletics at Saltus said the school’s athletic department “works extremely hard to prepare their student-athletes to ensure they are eligible for the next level of education and athletics”. The spokesperson said, “Athletes who represented the school in at least one inter-school event have also been recognized at the 5th Annual Athletic Banquet, with guest speaker Tyler Butterfield, a former Saltus student and two time Olympian, Iron Man and Triathlete. “Zakiyah Durham was named Female Athlete of the Year and Conor White repeated as Male Athlete of the Year. Good Work done by Saltus.